If there are two things a person can count on in Nebraska they are the heat and the genuine hospitality of the locals. On this particular day, Shane was wearing a shirt with the word NICE outlined by the state of Minnesota, but a person could just as well have replaced that with an outline of Nebraska. To escape the Nebraska heat, we found ourselves setting up shop in [Bar] while we waited for a Gregory Alan Isakov concert later in the evening. It came as no surprise that as we sat at our impromptu work desk, Nate noticed a young woman across the street hand change to a man in need. Nate quickly turned to Shane and asked, “Did you just see that? That guy with the white hair just walked up to that girl by the car asking for change and she didn’t hesitate to give him something.” Shane turned quickly to look out the window just as the individuals were parting ways. “No, I missed it,” he said. The plan worked perfectly, or so we thought. After placing the envelope in the driver’s window we hurried back to our post. As we sat down Shane pointed to a piece of paper in front of Nate and asked, “What is that note for?” With a worried look Nate said, “I forgot to put the note in it!” He ran back to the car across the street and set the situation straight without being noticed. We waited anxiously for the woman to return to her car, but as she exited one shop she entered another and then another until coming out of one shop with an ice cream cone. Instead of heading back to her car, she sat on a bench. Nate saw this and immediately said, “We should go talk to her!” In no time the bill was paid and we hurried outside to the bench. Nate, the master of conversation, made small talk with the woman. She told us her name was Sam and that she had just graduated college with a degree in architecture. 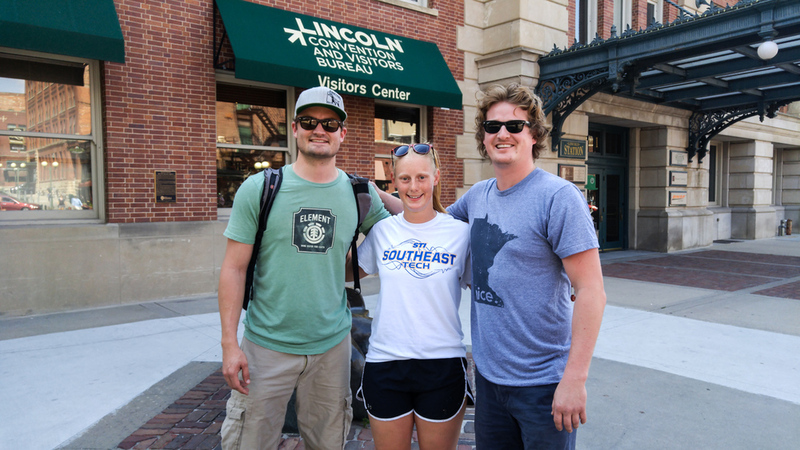 For her entire last semester of school she planned a road trip that would circumvent the nation’s heartland. We told Sam we were also on a road trip around the country doing random acts of kindness with Project Wildness. She was very interested in our nonprofit all-the-while with no idea she was currently part of our latest event. After lending us her tourist map and telling us where to go and what to see, Shane went into the ice cream shop hoping to give Sam a break in conversation to return to her car and her note. It all worked and we parted ways; Sam returned to her car, Shane to his ice cream, and Nate, well, he just disappeared. After getting a malt, Shane peeked out the door of the ice cream shop and noticed Sam looking puzzled with an envelope in hand. When she got into her car he bolted out the door and around the corner of the building to stay out of sight. A construction crew was moving in some machinery on the road and Shane figured it would be a good shield to hide behind while making his way to the car. Shane was wrong. Shane called Nate and told him, “We’ve been caught. Meet us in front of the ice cream shop.” As we exchanged more hugs and laughs with Sam she repeatedly tried to refuse the gift. “I can’t take this,” she would say. Shane explained to her that this is what we do with Project Wildness and how her good deed needed to be recognized. “This is your money to do whatever you wish with,” Nate explained. “You can use it for your road trip or give it to anyone else as a random act of kindness.” With this we exchanged another series of hugs and went our separate ways. 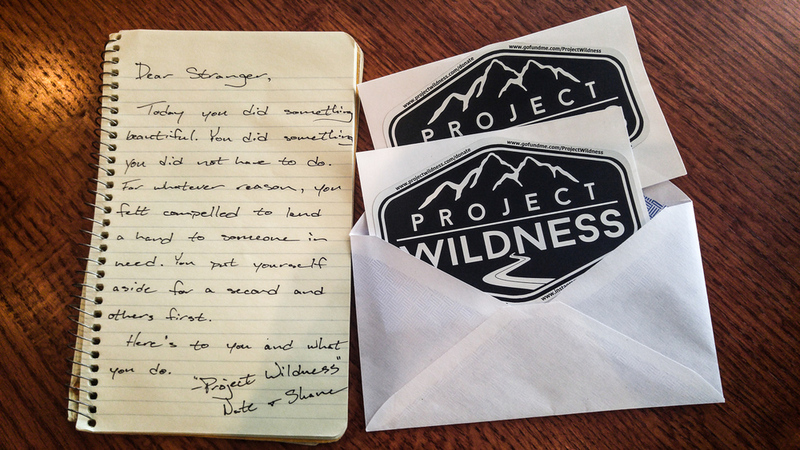 To Kathy and Dave… Nate and I can’t even begin to describe how much your support means to us and Project Wildness. If we make a post – you are sure to comment, like, and share it. If we have an event – you are there to support us. If we put out a call for donations – you respond without hesitation. There are days Nate and I feel the wear of this whole beautiful adventure. Some days we’d rather just sit in the woods away from the cities and the road and the people, but then our phones buzz and it’s the Meissner’s and their never-ending support. That’s when we pack up and hit the road. You asked us to buy gas for someone. Well, Sam is on an adventure of her own and your donation is helping her realize that grand trip. Thank you for all that you do!